Parking in downtown Washington can be frustrating, but a new parking program hopes to make the process a little less stressful. But, there's a catch -- it may cost you more money. 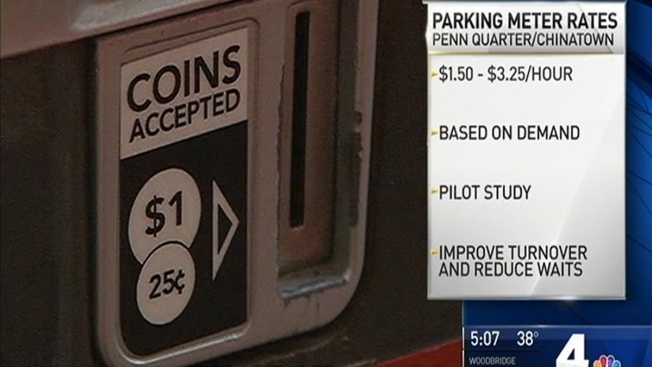 Starting Monday, drivers parking in the Chinatown and Penn Quarter neighborhoods may see the price of parking increase. Parking meter rates for blocks with high demand will increase while rates for blocks with low demand will decrease. Prices will range from $1.50 to $3.25 per hour. Like the cost of riding on Metro, rates during peak demand periods will be higher than off-peak periods. The program hopes to reduce the time needed to find parking and improve turnover of high-demand parking spaces. The study area includes on-street parking spaces bounded by H Street NW, 3rd Street NW, E Street NW and 11th Street NW. Details of the plan are available here.